The ship hit the whale with a force that snapped her 14-foot jawbone like a toothpick and left a 4-foot-long crack in her skull. Known as 2150 among scientists, she was a young, fertile North Atlantic right whale—exactly the wrong whale to lose in an endangered population that is struggling to increase its numbers. The call about 2150’s death in fall 2003 sent Regina Campbell-Malone, a biology graduate student in the MIT/WHOI Joint Program, to Nova Scotia. On a wind-swept beach, she and her advisor, biologist Michael Moore, and a team of colleagues and volunteers performed a necropsy. They took photos and measurements, and then carefully cut the whale apart to reveal internal injuries, marveling grimly over the extensive damage inflicted on the 45-foot animal. But in the world of commercial shipping, where time equals millions of dollars, simply asking vessels to slow down is not a straightforward matter. Propellers shred whales’ skin and blubber, often causing the animals to bleed to death. But the blunt trauma caused by a moving ship’s hull often leaves little to no external evidence. Instead, it breaks jawbones, ribs, and skulls, as Campbell-Malone witnessed with whale 2150. She and other scientists needed specific data to provide recommendations to policy makers for specific speed limits for ships. So she set out to determine and quantify the amount of stress whale bones can sustain before they break. To conduct her research, Campbell-Malone first needed bones. The skeleton from whale 2150 went to a Canadian museum. 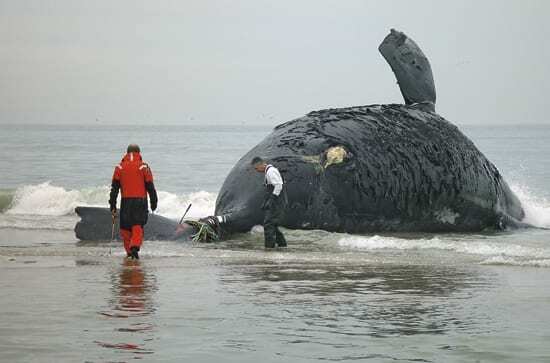 But several months later, a 53-foot right whale named Stumpy, who was pregnant with her sixth calf, washed up on a North Carolina beach after she was hit by a vessel. Campbell-Malone spent the next several years running Stumpy’s 493-pound right jawbone through a variety of stress tests. Her goal was to look at the bone outside and in. First, to measure its precise geometry (needed for computer models), Moore and Campbell-Malone hung it from a crane in a parking lot at WHOI. Then they used a laser to scan the bone, which provided a much more accurate 3-D view than measuring by hand. 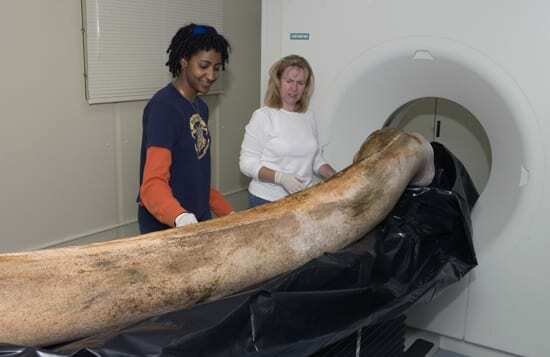 They anticipated that the pungent, 14-foot-long bone would draw local attention, though some of it was a bit unnerving. “Less than 20 minutes into this venture we noticed that we were surrounded by three coyotes eagerly licking their chops,” Campbell-Malone said. Next the bone went to the University of New Hampshire, where colleagues hung 1,000 pounds of steel weights on the bone and rigged it with tiny sensors to measure strain. Even the bone’s internal structure was not overlooked; Campbell-Malone squeezed cork-sized pieces of bone between metal plates to see how stress impacts the bone’s tissue and internal structure. Then she helped collaborators at the University of New Hampshire to develop computer simulations of whales getting hit by vessels. This summer, plugging data into the computer models, she and colleagues at WHOI, UNH, and the University of Delaware will determine recommended speeds for various-sized vessels to prevent damaging or fatal collisions with whales. Mesmerized as a child by Jacques Cousteau television specials, Campbell-Malone grew up in Buffalo, N.Y., “dreaming of becoming a marine biologist.” But she was 20 before she saw the ocean for the first time. She explored a less-well-traveled career path. After graduating from The State University of New York at Buffalo with a degree in ecology and evolutionary biology, she took a variety of jobs with the National Institutes of Health, NASA, and the Duke University Marine Laboratory before writing an e-mail to the author of a class textbook—marine mammal expert Peter Tyack at Woods Hole Oceanographic Institution. Not long after arriving at WHOI, with an ever-expanding understanding of marine science, she was determined to pass along her knowledge to children and young adults. “I wanted a way to introduce them into science, a rather daunting, foreign area for many kids, especially since I spent so much time figuring out the path to get me into my field of study,” she said. During her years at WHOI, she has worked with dozens of elementary, junior high, and high school students, traveling to classrooms or bringing classrooms to WHOI. Campbell-Malone doesn’t give standard lessons; instead, she literally plunges young people into science. 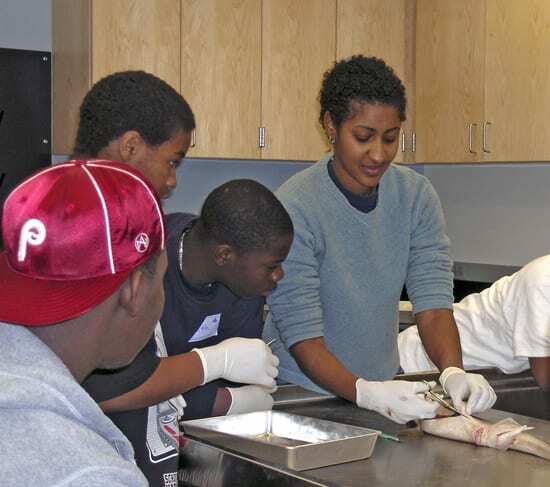 Students from Dorchester, Mass., waded with her into Waquoit Bay and netted redfish and haddock for a fish survey. She had fourth-graders in Falmouth wear special tinted glasses to understand how fish hide from predators in the dark ocean depths. Of the 536 people who have received Ph.D. degrees in the MIT/WHOI Joint Program’s 40-year history, Campbell-Malone is the second African-American. Surprised about the lack of diversity in oceanography, she turned her energies into making a difference. Each fall she speaks at an undergraduate minority fair in Boston on behalf of WHOI Academic Programs. She also sets up tours for students in the MIT Summer Research Program. “Their visit to Woods Hole gives our scientists access and exposure to a group of talented students from around the country who may have never considered a future that intersects with ocean science,” she said. Campbell-Malone said she is especially proud of Diversity Day, a daylong event launched in 2006 by Woods Hole science institutions to encourage conversation and celebrate the diverse people and cultures in the local community. This research was funded by the National Science Foundation, the Quebec-Labrador Foundation, MIT, the National Oceanic & Atmospheric Administration, and the Ocean Life Institute and the Academic Programs Office at WHOI.